Do you fear that a couple throwing errors will lead to more and more? Do you start thinking about your throw as you are throwing? Thinking about an otherwise unconscious skill (throwing a baseball) while trying to execute the throw actually interferes with the process. 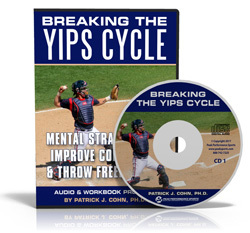 The yips can emphasize the problem of over-thinking. 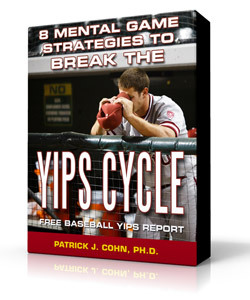 The yips are a phenomenon where you switch unconscious to conscious thinking. Consciously thinking about throwing the ball handcuffs fielders and causes routine plays to become exceedingly difficult. Think about this for a minute, after you learned the proper mechanics of throwing the ball as a youngster, it became automatic or without conscious thought. Despite making some throwing errors, you didn’t forget the mechanics of throwing a ball… Your thinking got in the way. Some players respond to a few errors by paying attention to every detail of the throw from the grip and release point to the outcome. Then, during the stress of game time, you become overwhelmed as memories of past errors flood your mind. At this point, it may feel impossible to make an accurate throw. 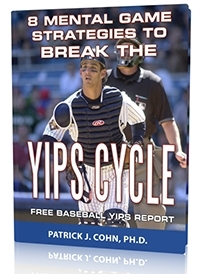 Steve Sax, former second baseman for the Los Angeles Dodgers and New York Yankees had a well-known case of the yips. Sax made 187 errors through the years 1981-1992. Sax remembers when his throwing yips started. In his third MLB season, Sax fielded a ground ball with a runner on third, the runner held up at third but Sax fired the ball in the dirt resulting in the runner scoring. Sax ruminated about that play so much that it haunted him and resulted in 30 errors that season. Sax’s throws became so wild that people sitting in the first base stands occasionally wore helmets. Sax had such difficulty with the yips that it put his career in jeopardy. Actually, Sax did regain his confidence and ability to make plays in the field. In 1991, Sax posted a .990 fielding percentage. What strategy did Sax utilize to regain his form? Instead of taking his time to throw the ball to first, Sax sped up the process, used a key phrase to help his focus and rehearsed this strategy over and over in practice until it became second nature. Basically, Sax re-taught himself how to the ball… not technically but mentally. Sax is a testament that the yips can be overcome. Cut yourself some slack… Errors are part of the game. Since you can only think a thought at a time, focus on a key word or phrase or count 1-2-3-4 as you throw the ball. It will help you focus your mind on what you are doing and not the fear of making a mistake.